Notes The idea was based on French half-track designs that was acquired by the US army in the interwar period. 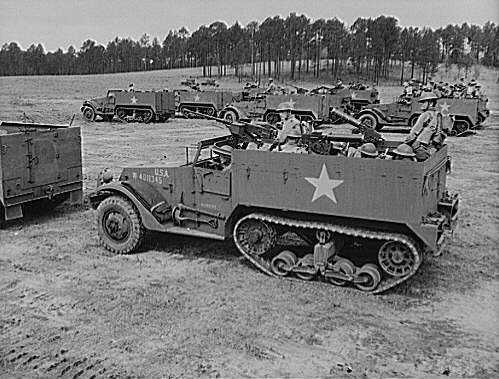 The US army required a vehicle that could be used a personnel carrier and as an artillery tractor. After early prototypes they finally merged the hull of a M3 scout car with running gear based on a caterpillar tracked truck called the T9. The resulting M2 design was used as an artillery tractor and a reconnaissance vehicle with facilities for weapon storage. They had a skate rail to mount the various Machine guns, but had no rear door so access was from over the hull sides. They were built by White, Autocar and Diamond T and saw action in the Philippines, North Africa, Sicily and Italy.